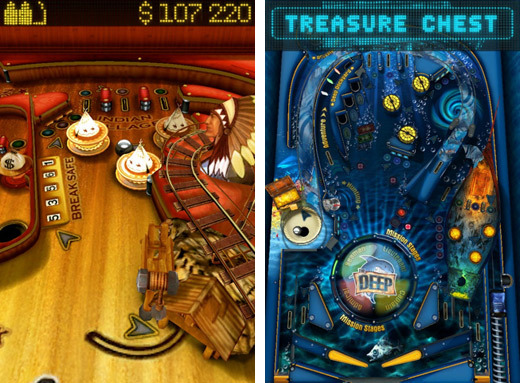 Shortly after the iPad arrived, Gameprom treated iPad gamers to Pinball HD [App Store], a collection of their excellent stand-alone iPhone pinball titles — Wild West Pinball [$.99], The Deep Pinball [$.99], and Jungle Style Pinball [$.99] — all in one high resolution, iPad application. We found the title easy to recommend, and we weren’t the only ones; Pinball HD was a WWDC 2010 Apple Design Award winner. When the iPhone 4 was unveiled, sporting its high resolution Retina display, we hoped to see the same fine collection adapted to suit Apple’s new iOS flagship. And, today, we’re happy to report that Pinball HD 4 iPhone [link] has arrived and is now available for download in the App Store. Like its forerunner, Pinball HD features split-screen, tap paddle controls, WiFi and Bluetooth multiplayer, online score tracking, and support for 3D anaglyph (red/blue, etc.) glasses rendering. And you get all that for buck less than the iPad version. Any pinball fan with an iPhone 4 (or a 3GS if you’re new to the series) needs to get this game on their device.